Last night I finally watched Pirate Radio (a/k/a The Boat That Rocked) on HD pay-per-view, as it seems I can never make it into a regular movie theater these days. I quite enjoyed this romp through the short life of a fictional 1960s UK pirate radio ship, inspired by the infamous Radio Caroline. 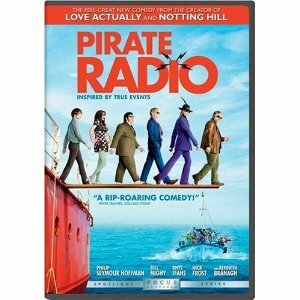 While the film exaggerates things for drama and laughs, it nevertheless does a good job at illustrating the significance of pirate rock ‘n roll radio to a nation whose mainstream government-run media was stuck in a rigid cultural torpor, utterly in denial of rock’s brewing revolution. And it does this without sanctimony or excessive sentimentality. What many probably don’t realize is that pirate radio is still going strong in the UK, especially in big cities like London. Contemporary pirates are also inspired by the fact that the BBC still doesn’t play a lot of cutting edge popular music, which these days means electronic music and British forms of hip-hop….